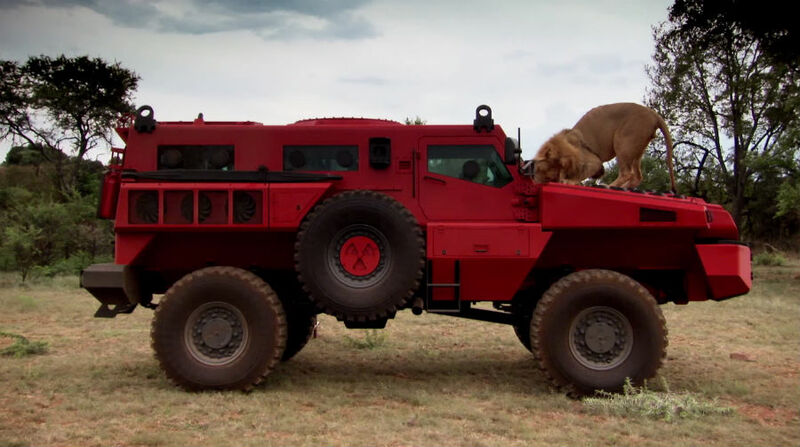 The Marauder is a rugged and maneuverable armored armored vehicle produced by South Africa’s Paramount Group. 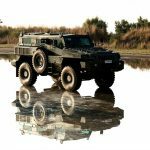 First revealed in 2007 at the International Defense Exhibition in Abu Dhabi, the Marauder comes in both 4×4 and 6×6 versions and fits a variety of mission types. 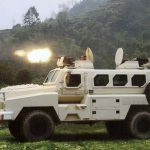 Current variations of the Paramount Marauder include command posts, ambulances, armored personnel carriers, fire support, and anti-armor vehicles. 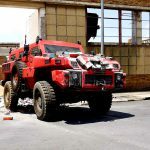 The Marauder’s design makes it highly maneuverable in rugged terrain while maintaining increased protection against small arms and mines for its crew. 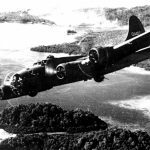 It can be airlifted by a CH-47 Chinook helicopter or air-transported in a C-130 Hercules aircraft and is used extensively by the African Union for peacekeeping and other operations. 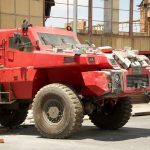 The Paramount Marauder is a mine protected armored vehicle. 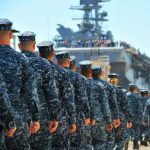 Its armor plating provides ballistic protection against 5.56mm, 7.62mm, and .50 caliber rounds and it’s deep V-shaped hull provides protection against mines. Similar to the MRAP and other mine protected vehicles, blast energy is diverted away from the vehicle as it strikes the oblique angles of the hull’s V-shape. This specialized vehicle provides blast protection against 14kg of TNT beneath any of the wheels, 8kg TNT underneath the hull, and 50kg of TNT from a side blast. The internal design and crew seating layout also increase survivability inside the double-skinned hull. Furthermore, the Paramount Marauder has additional armor that can be installed to increase the armor profile of the vehicle should the need arise. The Marauder’s armament capabilities are quite flexible. 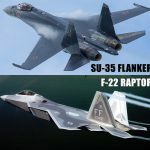 It has the capability to mount both light and medium caliber machine gun platforms as well as mortar firing positions, missile launchers, and small cannons. The vehicle also comes with a variety of stowage capabilities, allowing it to carry a variety of ammunition types for longer operations. Optional equipment includes additional sensors as well as night vision equipment. The base model Marauder has a crew of two with capability to seat eight more in full combat gear. 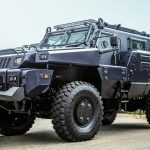 At 2.66 meters high and 2.75 meters wide the 18,000kg Paramount Marauder has a cargo payload of 4,500 kg. 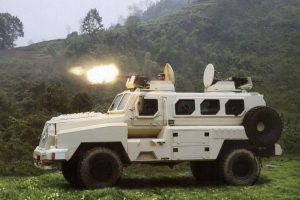 The stretched 6×6 variant offers increases in both cargo and troop capacity. 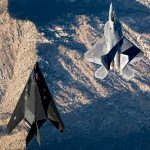 Both vehicles can fit into the belly of a C-130 Hercules (and similarly sized aircraft) or airlifted by a CH-47 Chinook helicopter via sling-load. 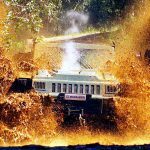 The Paramount Marauder comes equipped with one of two diesel engines: the 300 horsepower Cummins ISBe4-300 or the 240 horsepower MAN D0836LOH. 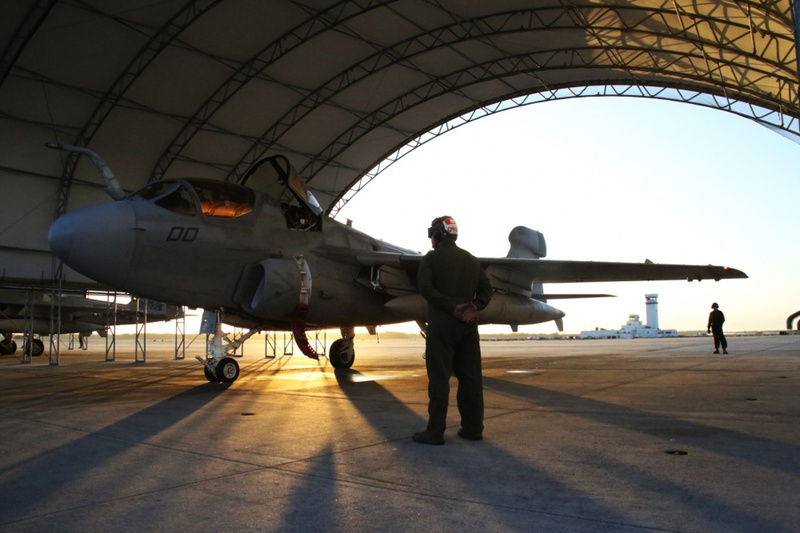 These engines allow the Marauder to travel at speeds of 75 mph with a range of 435 miles. Rugged and maneuverable, the Marauder can traverse a variety of terrain types. It can handle a 60% grade as well as a 30% side slope, cross 33 inch ditches, and step climb ledges 19 inches height. The Marauder can also ford up to 2.9 feet without preparation. The Marauder is available in both 4×5 and 6×6 configurations. 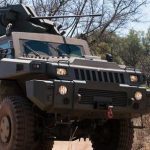 Paramount Group leveraged South Africa’s decades of experience against both conventional and unconventional forces to design their maneuverable and sturdy Marauder. In 2008 Paramount Group signed an agreement with King Abdullah Design and Development Bureau (KADDB). Per that agreement Jordan’s KADDB currently manufactures the Marauder. Naturally, Jordan became the first to purchase the vehicle. 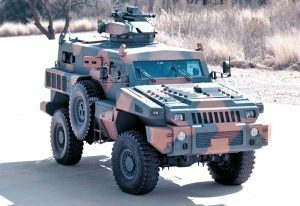 Used in both international peacekeeping and internal security, the Marauder has seen extensive use by the African Union, and can be adapted to fit a variety of roles. 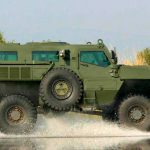 Current variations include an armored personnel carrier, ambulance, command post, anti-armor fire support, infantry fire support, patrol vehicles, and mortar carriers. Unfortunately for Paramount Group, production of the Marauder has been limited. 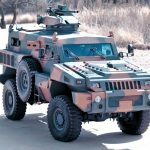 Although Algeria, Azerbaijan, Jordan, Congo, Kazakhstan, Malawi, Oman, and Singapore have all purchased Marauders, no major, large scale military power has purchased the vehicle. As of September 2016, only 250 Marauders have been produced.